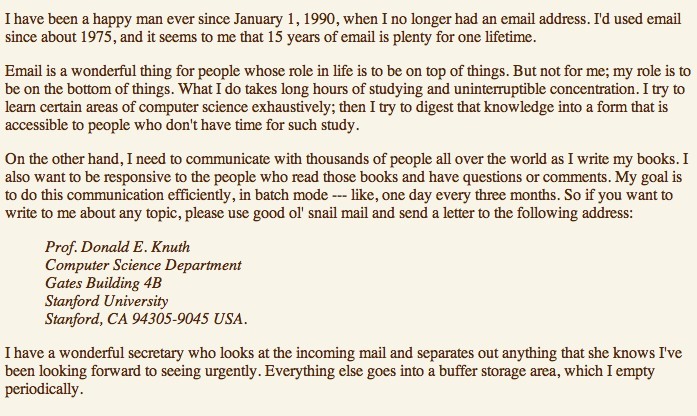 When email first spread to campuses in the late 1970s, it simplified crucial tasks like communicating with distant collaborators, but as its ubiquity grew, it became a public portal through which the world beyond close colleagues could make increasing demands on a professor’s time and attention, making email into a kind of digital water torture for the scholar struggling to think without interruption. Another factor driving the professoriate’s drift into middle management is a significant increase in administrative demands. In part, this is due to the growth of university bureaucracy, which, once established, inevitably consumes the time and attention of its subjects to justify its existence. The problem with email is economics: the cost of composing and sending an email is close to zero (just a few seconds of your time and a click), whereas the cost of patiently writing up a note by hand or of typing and printing a letter on actual paper is non-trivial. It should thus surprise no one that the volume of emails has skyrocketed relative to the volume of notes and letters. To solve this thorny collective action problem, we hereby propose an “email ceasefire” in Academia to take effect this fall: if students and staff promise to stop sending us emails, then we faculty will promise to stop sending emails as well. (The ceasefire would commence in the fall to give everyone sufficient notice.) Would such a ceasefire hold for long? Who will be the first to defect?